I like a good discussion. That is my goal every time I walk into a classroom. I want students regardless of age to ask questions and even challenge me, as was the case a few weeks ago at Portland High School. Within the first five minutes or so, I can get a rough gauge of the overall class dynamic and determine which course the discussion will take. What a great spot for a delicious dinner and compelling conversation! The location was the original Rosemont Market and Bakery in Portland, Maine. 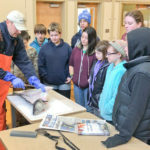 The “students” were in fact area adults interested in learning more about the local and global seafood system. The discussion was free-flowing, dynamic, interactive, engaging, humorous. Just about all that I had planned for when originally working with Chef Bryan Dame to set up a sustainable seafood dinner a couple of months ago. The goal was to pair creative, tasty dishes featuring local, abundant seafood with a conversation about where the seafood comes from (ie, the boat and/or the harvester), and why knowing this kind of information is important. So we first talked about a common definition of what sustainable seafood is and isn’t. As I explained how the average seafood consumed in the U.S. travels more than 5,000 miles from boat to plate, we feasted on locally sourced pollock and mussels ceviche served over a creamy corn pudding. The accompanying seaweed biscuits and sea salt nori butter were surprisingly addictive. I mentioned the pollock came from the Finlander out of Eliot, Maine, a boat that travels some 80 miles off shore to jig fish for pollock, haddock and other groundfish species. Jig fishing means virtually no bycatch, or the capture and possibly killing unintended species, a significant problem with some wild harvest methods. The conversation then turned to the domestic and global seafood picture, with perhaps a little surprise at the revelation that 90% of the seafood eaten in the U.S. is imported. We discussed the implications of that while diving into Acadian rockfish served with local spinach and a bacon jam that would make anything taste better. (I kept thinking about ice cream.) The rockfish, also known as ocean perch or Acadian redfish, was supplied by the Dee Dee Mae II out of Biddeford. We also looked at how global seafood demand continues to grow as the population surges toward 9 billion by 2050, and how almost 5 billion people now depend on seafood for at least 10% of their per capita annual animal protein intake. And as the wild harvest of seafood has remained relatively constant over the past decade, aquaculture has nearly doubled. We discussed how bivalve (oyster, clam and mussel) and seaweed aquaculture is growing in Maine as we ate pan-roasted hake served over smoked mussels and spring pea puree with pillow-soft potato gnocchi. The mussels came from Pemaquid Mussel Farms and the seaweed (used in almost every course) came from Maine Sea Fresh Farms. The hake came from the November Gale out of Five Islands, Maine. 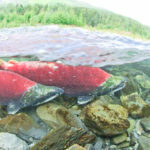 Finfish aquaculture and the ramifications of recent U.S. and Canada approvals of GMO salmon sparked lively interaction about balancing the needs of feeding a growing global population and addressing the many concerns with farmed fish. Hormone and antibiotic use, disease, environmental degradation (such as clearing out critical nursery habitats like mangroves for shrimp farms) are all significant challenges to widespread acceptance of fish farming. GMO salmon have a much steeper hill to climb because of the significant issues with the lack of labeling and questionable science. The group collectively pondered the ramifications while dipping into dessert: dulse panna cotta (a subtle, unique whisper of the sea) with light, toasted sesame cookies. The food and the narrative were perfect complements. And the evening reminded me why I started One Fish Foundation. 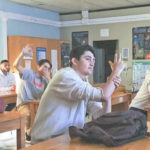 Engaging people, no matter the age, in a discussion about where their seafood comes from, and why they should think about their decisions at a restaurant or seafood store is important to them and the resource. Just as with farms, we have a connection to the fish and shellfish we eat, and those who harvest them. And every decision we make has an impact on the resource. All of the fish we ate was local and abundant, which are two of the most significant factors in determining seafood sustainability. Chef Bryan delivered on the promise of making what was once called “trash fish,” but is now better known as “abundant”, sing in beautifully prepared and creative dishes that we all enjoyed immensely. We sourced the fish from Harbor Fish Market in Portland, which is where Rosemont gets most of the seafood they offer in their five area markets. 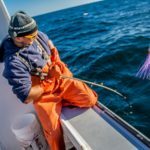 Harbor Fish does a good job at sourcing locally, whenever possible, and being forthright about where its seafood comes from. That’s an important factor when deciding where to buy fish. You want to know they’ll tell you the truth about its provenance. 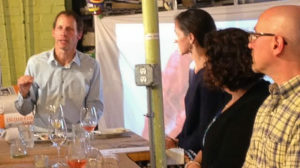 Rosemont owners John Naylor and Molly Thompson were very gracious in welcoming One Fish Foundation into their “kitchen.” The level of dialogue was inspiring, hopefully to the point that the conversation will continue among those who attended, and spread into their communities. Photo credits: Molly Thompson. Top: Chef Bryan Dame, seaweed whisperer.